Performers include: Sam Murphy, Rob Boltin, Nora Dunn, Samantha Quan, Elizabeth McGovern, Teresa Celentano, Donavon Stinson, Nathan Keyes, Ona Grauer, Zahf Paroo, Reece Thompson, Rob LaBelle, Lynnanne Zager, Haley Beauchamp, Jason Bryden, Henry Czerny, and Katie Stuart. An American science fiction “dramedy” set in a small Vermont town. An asteroid has hit the Moon and shattered into three fragments, threatening to eventually fall to Earth and end life on the planet. The threat of an eventual “Judgment Day” causes the population to question their lives and make extreme choices, like quitting their jobs, indulging vices and living each day as though it were their last. 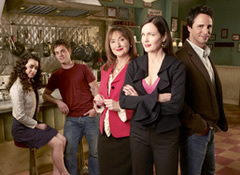 The series particularly focused on the Davis family; single mother Laura (Elizabeth McGovern) and her two children Lydia (Teresa Celentano) and Alex (Sam Murphy). Laura faces a difficult decision, made all the more complicated by her feelings for Mack. Lydia makes a rash decision, and Alex and Claire get into a tangle. And just when Laura and Mack dare to take the next step, in walks a blast from the past. Meanwhile, Michelle Graybar gets sent to the moons. First aired: September 24, 2006. Thus far there has been no news of a reunion or revival to wrap up the series. • Three Moons Over Milford was cancelled after one season due to low ratings. The premiere attracted 1.6 million viewers and declined for future episodes. All episodes aired but the storylines were not resolved. • Though set in Vermont, exteriors for the series were filmed in Ladner, British Columbia. Ladner has also been used for TV shows like Smallville, The X-Files, Stargate SG-1, and Supernatural, as well as movies like Final Destination, Deck the Halls, and X-Men 3.